The contest veered between bat and ball, dominating certain passages and providing the limited crowd with entertaining viewing, but, at the end of the day, New Zealand had their backs firmly to the wall. The match was intriguingly poised with Sri Lanka at 295 for 4, but Thilan Samaraweera, with help from Chamara Kapugedera, powered Sri Lanka into the box seat with a breezy 72-run stand. Then the tail imploded - five wickets went down for 27 - to let slip a position from which they could have batted New Zealand out of the game. Samaraweera's fourth century of the year, though, guided the home side past 400, and the Sri Lankan quick bowlers struck thrice early to grab back some of the momentum the visitors had seized. A limp reply from New Zealand, which included the haphazard dismissal of Martin Guptill, left the middle order with too much. Dammika Prasad, taking the place of Nuwan Kulasekara, struck with his first ball to get Tim McIntosh, though replays suggested he was lucky. Thilan Thushara needed no such help in getting Daniel Flynn to nick one that pitched outside off stump and held its line. Guptill showed brief resilience, playing some cracking on-side strokes, to race to 29 from 26 balls. Then Thushara tested him with a series of bouncers. Guptill hooked one for four. The next ball reared into his ribs and he gloved it to fine leg. A man went out to deep square leg. Three in a row followed and Guptill was visibly torn between leaving or pulling. Then he got another short one and fell for the trap, getting a top edge straight to the fielder placed back. On air, an incensed Danny Morrison called it "brainless cricket". Ross Taylor led a passage of recovery with Jesse Ryder, adding 85. Taylor took his time, playing out 31 deliveries for 10, before opening up with some aggressive shots through the off side off Prasad. He survived an extremely tight call on 30 against Muttiah Muralitharan but continued to sweep the spinner. He was dropped on 56 off Murali, but was left looking from the other end as spin accounted for Ryder, popping to short leg, and Jeetan Patel, edging to slip. Unfortunately for New Zealand nobody could match Taylor's defiance and shot selection and the tourists found themselves struggling for survival. New Zealand had brought themselves back into this match well after lunch after Samaraweera made 500 look a distinct possibility, but their top order failed to reciprocate. Without Samaraweera, Sri Lanka would have really struggled. Iain O'Brien put New Zealand on the right track with a good first spell of quick bowling on an unresponsive track, dismissing Mahela Jayawardene when a hundred seemed inevitable, but the visitors again sat back to allow Samaraweera flourish. A sumptuous on-drive for four - taking him past 1000 Test runs this year - set the tone for his innings along. The eighties were a blur as Samaraweera unfurled slow-motion pulls past square, spiffy drives past cover and a couple of deft dabs. Samaraweera slowed down after Jayawardene's dismissal, facing 14 balls when on 99, but eventually reached the landmark, after 277 minutes at the crease, with a push between cover and point off Martin. The next ball was hooked for six, a release of adrenalin. A classy drive past cover followed off Jacob Oram, who continued to bowl without pace or menace, after which Samaraweera clouted Jeetan Patel for consecutive fours, unafraid to go over the top. Kapugedera, who enjoyed a life on 9, eased his way to 35 before miscuing to mid-off four minutes before lunch. New Zealand came out after the interval and turned in their best passage of the match. Chris Martin began the session by bouncing Prasanna Jayawardene, who top-edged to long leg. Then Patel struck, first getting Prasad to poke to slip and trapping Herath lbw next ball. 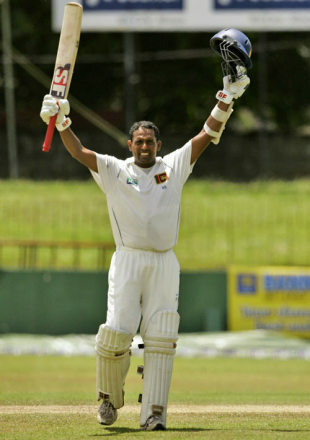 His fourth victim was the man of the moment, Samaraweera, who gloved a reverse-sweep to depart for an excellent 143. It was an inning of insatiable determination and skill, and New Zealand - like Vettori had hoped - didn't manage to learn from it. Taylor will need much of the same determination shown by Samaraweera to help New Zealand leave Colombo without suffering the sort of crushing defeat they experienced here in 1998.